Nominees and winners of a Dutch Caribbean Pearl Award with OCaN president John Leerdam. Photo by Xaxier Donker/Stichting OCaN. THE HAGUE–Donating money for victims of Hurricane Irma in St. Maarten is fine, but that does not make you a true volunteer. “Volunteering is about dedicating time and about connecting with the heart,” Gwendell Mercelina said on Saturday at the fifth DC Pearl Award evening. 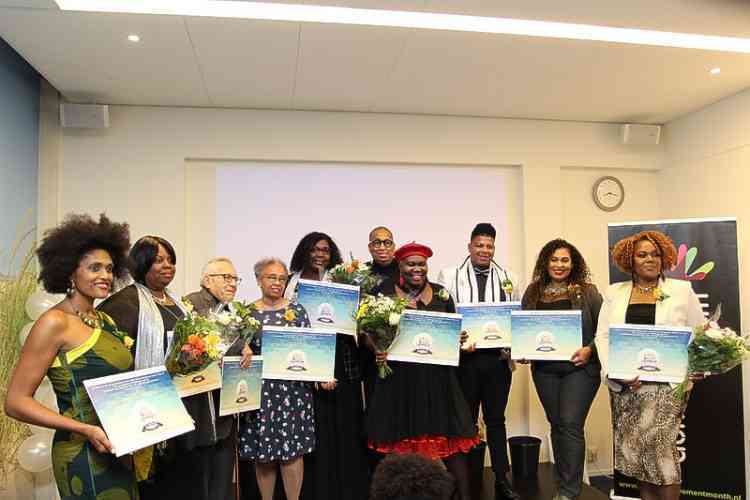 Three people volunteering for the Caribbean community in the Netherlands received a DC Pearl Award. Jacinto Zimmerman won the Professional Volunteer Award for the activities he organises in and near Eindhoven. Mabel Manuel received the Innovative Volunteer Award for training and coaching youngsters in the media field. Soraima Martina won in the category All Round Volunteer. With her foundation Rhamma-Ah she supports Caribbean families in Rotterdam. Gloria Summerville and Damien Juliana received special mention. Summerville brings HIV and AIDS to the attention of the Caribbean community in the Netherlands, while Juliana helps and coaches young people who have either a criminal background or mental problems. The DC Pearls are a Foundation OCaN initiative.